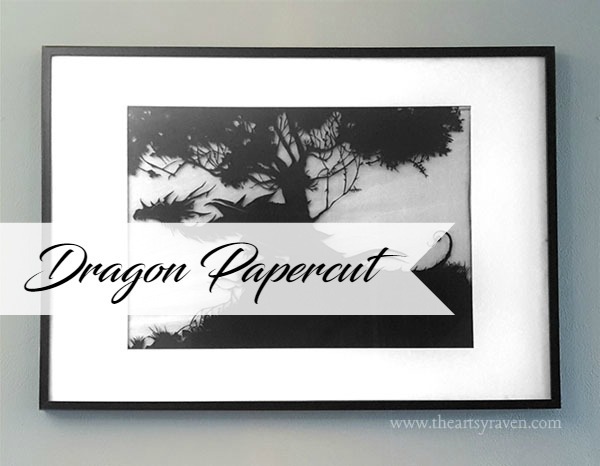 Papercutting is an art form I first tried back in 2010. I remember the year because my son had learned to walk and I had to make sure he wasn’t near me when I used the x-acto knife. My first projects were small, but I was happy about the result and knew I wanted to challenge myself and try a larger project in the future. It took me two years before I finally had an idea of what kind of design to go for, and I only decided because I was planning a birthday gift for my husband. 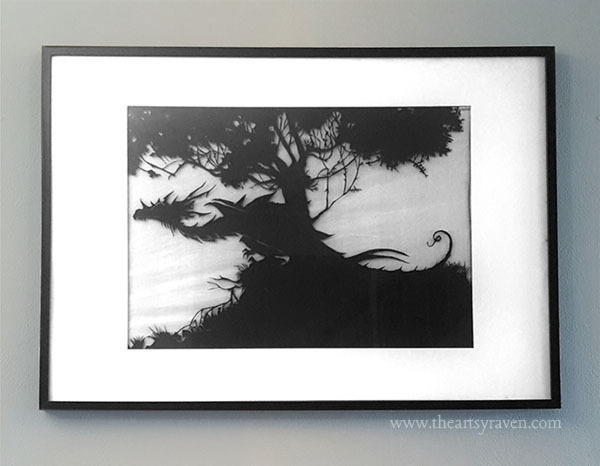 My husband loves dragons so I did some searching and found this amazing digital silhouette and decided to use it. I used black A3 cardstock for this piece. It’s a good size, but there is also some negative sides about the kind of paper I used, it’s thick and hard to cut through. It wouldn’t be too difficult if the design didn’t have a million small details. 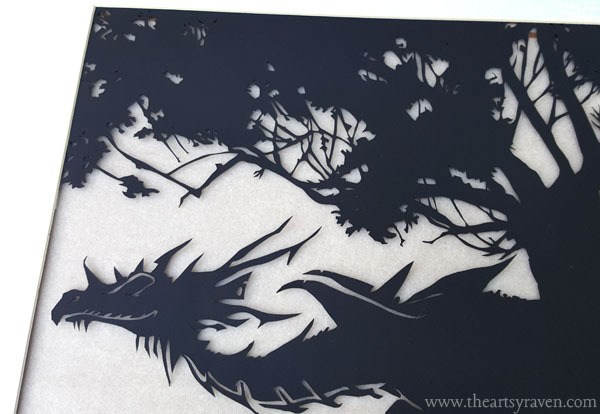 I wasn’t even one third through the cutting before my wrist ache and I constantly needed to take small breaks. 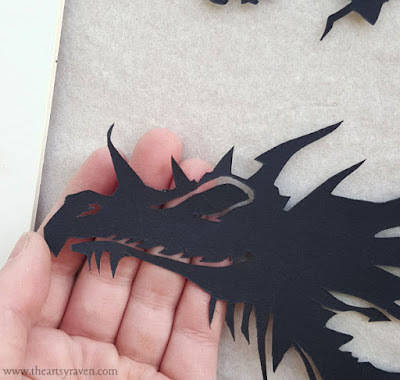 Because the cardstock was so thick I needed to cut the same spot two or three times, unless I pushed harder, which often lead to my wrist aching even more. The apartment we lived in at that time was small, so I claimed the livingroom for the three days it took me to cut this, having to cover it up every time my husband called to let me know he was coming into the room. I’m certain that if the paper wasn’t so thick it wouldn’t have taken me as long to finish it, but at least I had a sharp x-acto knife, which is important to have anyway. The frame is from IKEA. It’s not too bad, but the quality isn't that great, and it's also not glass. Another issue we faced was humidity in the apartment we lived in at the time, which ruined one side of the frame. I will most likely switch to a higher quality frame later but right now I have other things to waste my money on. The art hangs in the livingroom, and when people first see it they think it’s either a painting or a poster, and are always impressed when they get closer and know what it really is. I love receiving positive feedback from guests, but I’m most happy that my husband loves it.